THQ was torn apart like Osiris yesterday, its studios and best-known games scattered all over the world in the hands of new owners. Koch Media got Volition, Crytek got Homefront, Ubisoft got South Park and, as predicted, Sega got Relic. But as far as we can work out, Relic left perhaps their most venerable series behind. That’s why a small interactive media company are setting out to buy the rights to Homeworld themselves. teamPixel have until now specialised in web design, web development, desktop software, and mobile applications, but a little experience in locally-commissioned game development has been enough to persuade them that they’re the best team to make Homeworld 3. “We here at teamPixel, LLC are tired of waiting for the next Homeworld game and would like to rally fans together to bring the franchise back,” reads their IndieGoGo project’s blurb. And what do teamPixel intend to do with Homeworld? Their plans are threefold. First, to release the original games on GOG and Steam to ensure the series will “no longer be confined to scratched CDs and illegal file sharing”. Lastly, they intend to develop Homeworld 3. If $50,000 sounds like a laughably small amount with which to both purchase the Homeworld rights and develop two games, that’s because it is. Consequently, teamPixel plan to buy the IP with the IndieGoGo cash and use pre-order campaigns to fund the production of the new titles. They’re also planning to draw on “equity funding, credit, and even the pocket change of our staff”. Fortunately, this long-shot in space is safety-netted by a refund guarantee should some rather larger company swipe the Homeworld rights from over teamPixel’s head. 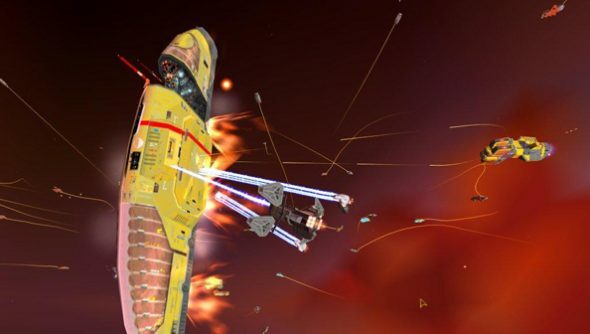 “We will make every effort to continue to pursue the Homeworld franchise from THQ and any subsequent buyer,” says campaign organiser Robert Santos. “Given the separation of Relic and Homeworld at THQ and Relic’s production timetable leaked during bankruptcy proceedings, I currently believe the bankruptcy did not interrupt the production of any unannounced Homeworld games, and it is possible Sega may have no interest in the series either given Relic’s recent work. Tomorrow, then. If teamPixel do get the chance to bid for Homeworld, though, would you like to see them succeed? And, if not, who would you prefer to see develop a new sequel?